The reboot of the Star Wars franchise this year with “Star Wars: The Force Awakens” means that both hobbyists and corporations alike will ride the wave of renewed interest in the series with home-spun creations and merchandising. For fans of the both the original trilogy and the prequels, flimsy plastic figurines and Lego sets were the best they could hope for. Yet for the new crop of Star Wars fan who will grow up with the latest trilogy, model Tie Fighters and X-Wings that can actually fly won’t be a dream, but a reality taken for granted. The market for drones has grown dramatically in past half-decade, and it was inevitable that someone would make them in the image of the spacecrafts in Star Wars, the only question was the timing. 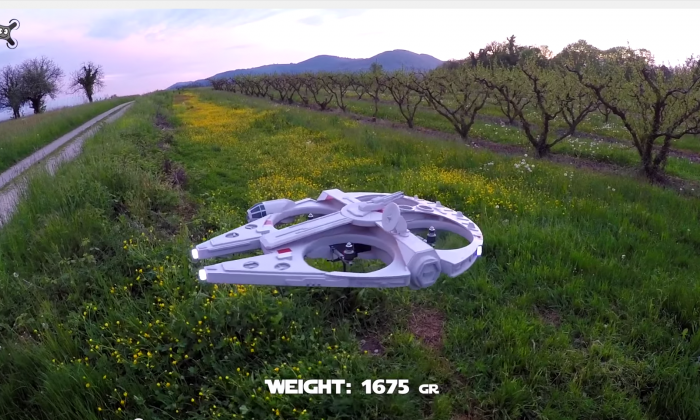 Last week, YouTuber Olivier C posted a video of an updated version of his Millennium Falcon drone, which glided around near the precipice of a vineyard for a few minutes. Olivier has also made drone models of the Tie Fighter and the Snowspeeder, and at the end of the video of the Millennium Falcon, a partially built model X-Wing was shown. Oliver also built a drone model of a Star Destroyer, which, deriving most of its aura from it sheer size, looked less impressive than his other models. Are Drone Studies the Next Boom in Tech Jobs?